All potential applicants who contact the Home are referred to the appropriate Board Manager of the County in which they served as a firefighter to obtain information and an application. The Board Manager then becomes the primary liaison for the application process. Once the application is completed in its entirety, it is then forwarded to the Home for clinical review by the Medical Director, Director of Nursing, Social Service Director and Superintendent to determine appropriateness. It should be noted that all required information must accompany the application in order for it to be considered. For your convenience, we have included SAMPLE forms below so you may familiarize yourself with the application. Please be advised, due to construction for the new Memory Care Unit, all applications approved after January 10th 2019 will be placed on a waiting list. Admissions will be scheduled as beds become available and based upon the order in which they are received. This information is only for display purposes. If you want to receive an actual application to apply to the New Jersey Firemen’s Home, please contact the manager of your county. If there are any questions, please contact our Social Worker, Ms. Ursula Baumgartner at 973-334-0024. The information below will help you navigate this process. One of the first tasks all families work through in working towards a successful admittance of a family member is navigating the application document. While the application document may appear lengthy and complication at first glance – it really isn’t – and this section of the Web Site is designed to HELP YOU get started. Prior to submitting the application document for review it is important to ensure ALL of the sections of the application are filled out and that the information requested is accurate. With each application mailed to an individual family, the Home Manger in the County where the applicant resides, is required to complete an “Application Check-List”, which must be signed prior to the application being reviewed for potential admittance. 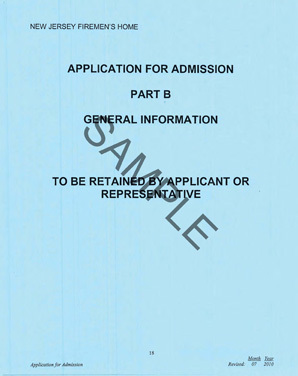 The “Check-List” is intended to ensure a complete application reaches the Firemen’s Home and that the overall admittance process remains uncomplicated and does not delay any qualified applicant. Throughout the application process, the Home Manager can provide answers to questions you may have and can assist you with obtaining records from other agencies – if you are unfamiliar with any section of the application. As you begin to think about the Firemen’s Home for your loved one we have conveniently provided you with an easily downloadable and printable “sample” application. The “sample” application will give you a working knowledge of the kind and type of information which is required on the application. When an application is formally requested, the application is then tracked for approximately 18 months from the date the application was received. Once a formal application is received, a family can immediately begin to provide the requested information. The Home Manager is then notified that an application has been sent and received. 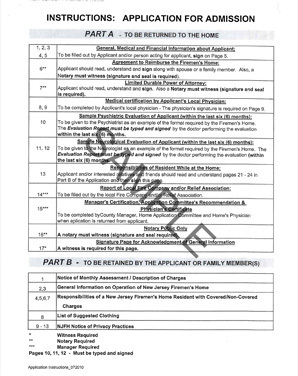 When a family believes they have provided all of the requested information, the application then goes to the Home Manager who completes his “Check-List” and ultimately signs the application. When a Home Manager signs the application and believes the application has been completed, the application is sent to the Firemen’s Home Application review committee. The application committee meets monthly and reviews ALL completed applications received. It is important to recognize the application committee reviews the completed applications in the order in which they are received at the Firemen’s Home. It is also important to recognize that a completed application does not guarantee an immediate admittance into the Home. There are several important factors which ultimately determine if the Firemen’s Home is a match with a potential applicant. Some of these factors include the availability of open rooms and beds; the ability of the Firemen’s Home to meet the Quality of Life needs and the ability of the Home to provide specialized medical care – often factor into determining if the Home can be everything you need it to be – and more. Before you download the “Sample” application – take the initial step of reaching out to YOUR HOME MANAGER and let them HELP YOU get started. The overall goal of the application is to ensure the Firemen’s Home is able to make an educated and informed determination when any applicant is presented for admission. You can use the Manager’s link to see who your Home Manager is and how to contact him. At the Firemen’s Homen EVERY APPLICANT MATTERS. It is our responsibility and duty to help you navigate this important step. THANK YOU for thinking of us… we are ALWAYS thinking of you.